We hope all is well with you and your family. That includes all your wonderful Lhasas! are having a great time. Our son has a nice fenced back yard for them to roam in. They live just outside of Victoria (on Vancouver Island). We felt their home was the best place for her for this long. Tony (our son) and family will spend a month in Maui in fall of 2011 so we’ll be returning the favour and Lana will have her playmate back at our ranch in Armstrong. Fred and I have never taken this long of a holiday here and it is absolutely wonderful, except that we really miss our Lana! We were prepared to bring her with us, but balked at the thought of her having to travel in ‘cargo’ on the flight here due to the agricultural restrictions. We were ready to comply with all the other complicated requirements set for Hawaii only, but not ‘cargo’! So “Lana banana” ( as I remember you calling her and I do once in a while as well) is having her own holiday. By the way she likes bananas, too! Often that is my evening snack and we share. 🙂 She has enjoyed a variety of vegetables from our garden this summer. Lana’s favourite toy above all is the ball, specifically the tennis ball. ( I have tried all other balls, not interested.) We go through a lot of balls as I throw them out as soon as they start to look ‘fuzzy’. She loves to fetch and if we are not throwing it for her she’ll invent games with it. She will throw it and sometimes quite a distance whether in the house or outside. She will take it to the top of the stairs on our deck and then nose it down, rush to the bottom to catch it before it hits the grass and sometimes not. She is a thinker and has great communication skills to let us know what she wants and defined play routines with each of us. We both adore her and I believe she does us. If I go away for several hours (even with Fred at home) she will ‘cry’ when I get home. 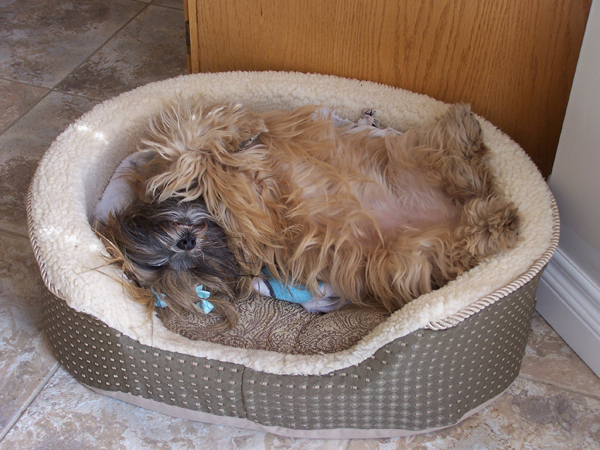 Our other Lhasa’s didn’t do that. They were happy, but not vocal like Lana. She is quite cuddly, too. For a Lhasa (the not really lap dogs) Lana does quite well on your lap or snuggled beside you. 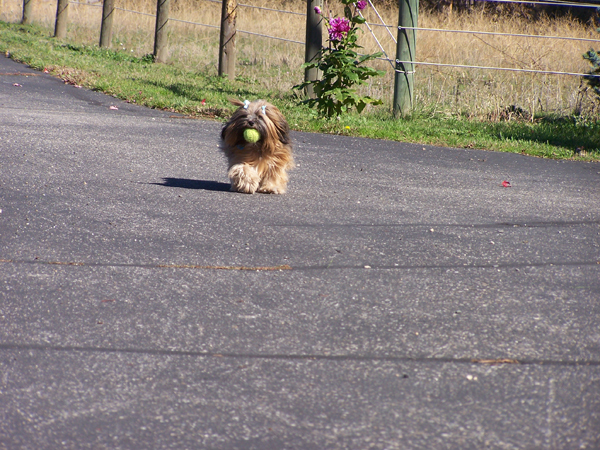 I’m attaching a few pictures of her in early October doing what she likes, one quite an action shot and one after play…. The last one is late October with her new short hairdo ready for the trip to our son’s. That would be just about exactly a year from the day we picked her from you! I took a picture from your website (grooming section) and asked the groomer to get as close to that as she could. I think she did a great job! We both wish you a Beautiful Christmas Season and Much Happiness and Good Health in 2011! “Mele Kalikimaka! Aloha from Maui! 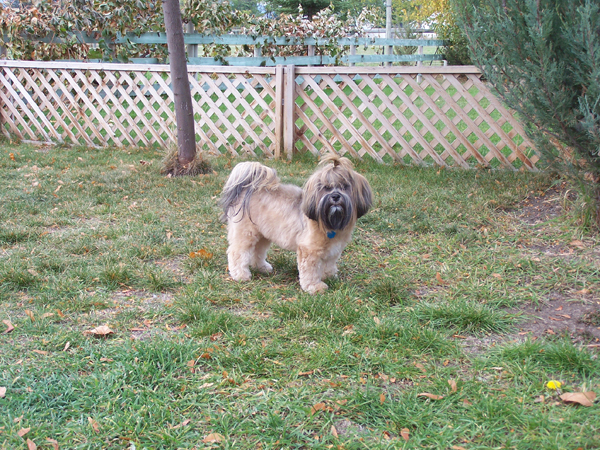 Thank You for our extraordinary Lhasa!